Adipogen – Recombinant Monoclonal | Tamar Laboratory Supplies LTD.
Adipogen Recombinant Monoclonal Antibodies – developed from a NON-ANIMAL SOURCE using in vitro antibody phage display technology. Developed from a human antibody phage display library. 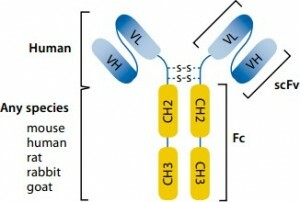 Consists of scFv (single chain fragment variable) composed of VH (variable domain of the human immunoglobulin heavy chain) and VL (variable domain of the human immunoglobulin light chain) fused to a Fc region. Produced in mammalian cells (CHO or HEK 293). Similar properties compared to monoclonal antibodies developed in mice / rat (e.g. affinity in the low nanomolar range). Standard secondary antibodies can be used. Ideal for conserved antigens (which are poorly immunogenic in animals). Detect conformational epitopes (e.g. GTP-bound proteins). Detect protein modifications (e.g. phosphorylations, ubiquitinations). Possibility to exchange the Fc region with Fc from other species.